We are recruiting Consultants looking to join a team to help redefine the delivery of Emergency Medicine in Shropshire. This is a chance for you to make a lifelong impact of the care of generations to come by developing the department and the staff you work with at the Royal Shrewsbury Hospital and the Princess Royal Hospital, Telford. The Shrewsbury and Telford Hospital NHS Trust is awaiting confirmation to undergo a period of major reconfiguration which will bring countless benefits to staff and patients. If approved, this will include modern facilities, new equipment, and increased capacity. We are looking for Doctors with commitment, drive, and a desire to make an impact transforming the delivery of care within our Emergency Department. 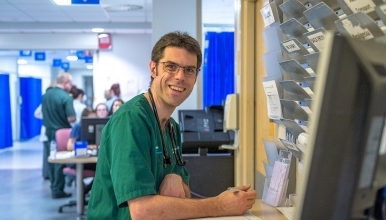 There is already a strong core of both substantive and long-term locum members on the team, as well as middle-grade doctors, specialist nurses, enhanced clinicians and dedicated support staff. One of the ways we are improving employee experience, staff involvement, and engagement, is by recruiting according to our Trust values, behaviors and attitudes - do you have what it takes to create the Safest Kindest Care in the NHS? Both hospitals are based in Shropshire and just 20 minutes’ drive apart. Shropshire is a wonderful place to live and few people would disagree. Shrewsbury, in particular, has recently been named as one of the top places to live in the country in the “Sunday Time Best Places to Live Guide”. It is a wonderful bustling place, with affordable housing, fantastic schools and great out-of-work activities for everyone. We are ideally located between the north and the south, making travelling around the UK extremely easy. As well as being only a short distance from major cities and busy transport links including Birmingham airport, our county also borders with beautiful north Wales which is abundant in outdoor activities, brilliant beaches, and thrilling scenery. It is also a particularly good time to join the Trust as we are currently working in collaboration with the Virginia Mason Institute in Seattle. We are one of only 5 UK trusts to receive this support from one of the safest hospitals in the world. We are 3 years into a 5-year journey - gain this valuable experience whilst you still can. Please read more about this role by downloading our candidate pack, which explains more about the department, the role, and living and working in stunning Shropshire. If you would like to arrange an informal visit, please contact Mr S Kumaran, Consultant and Clinical Director, on 01743 261082/01952 641222 Ext 4235 or emailing Subramanian.kumaran@sath.nhs.uk. Full time and part time applications are welcome, and the posts are available as soon as the ideal candidate or candidates are found. We look forward to hearing from you and showing you what we have to offer.